PLEASE READ THIS IMPORTANT INFORMATION BEFORE FIRST USE OF YOUR EGG®. KNOWLEDGE OF SAFETY INFORMATION WILL GREATLY ENHANCE YOUR ENJOYMENT AND SAFE USE OF YOUR BIG GREEN EGG! ALSO SEE FIRST TIMER TIPS. ALWAYS EXERCISE CAUTION WHEN USING ANY HOT COOKING DEVICE, LIGHTING CHARCOAL, COOKING WITH HOT CHARCOAL OR HANDLING HOT COOKING SURFACES. THE EGG, COOKING GRID AND CHARCOAL ARE HOT WHEN IN USE! DO NOT ALLOW CHILDREN TO PLAY WITH OR NEAR AN EGG. DO USE extreme caution when HANDLING OR removing hot cooking surfaces including the cooking grid, convEGGtor or the pizza/baking stone. The metal cooking grid and ceramics will be extremely hot. Take care to place them somewhere where they can’t burn anyone or come into contact with combustible surfaces. Always use protective gloves and gripping tools to avoid burns. Always exercise caution and keep children, pets and clothing away from an EGG while in use. ALWAYS TAKE CARE WHEN HANDLING HINGE ASSEMBLY, TOP VENT CAP AND STAINLESS STEEL DRAFT DOOR TO AVOID POSSIBLE INJURY FROM HOT SURFACES OR METAL EDGES. ALWAYS USE EXTREME CARE WHEN MOVING, TRANSPORTING, LOADING OR UNLOADING AN EGG AS THE PRODUCT IS HEAVY AND PERSONAL INJURY OR DAMAGE CAN OCCUR IF DROPPED OR TIPPED OVER. EXERCISE CAUTION WHEN HANDLING, LOADING/UNLOADING AN EGG TO AVOID ANY INJURY FROM METAL PARTS OR HOT SURFACES. PLACE AND USE YOUR EGG IN A SAFE and LEVEL SPOT. DO NOT place an EGG on a slope, uneven deck surface or under low trees or branches or in any area where it can be knocked or tipped over. Use the locking casters on the Nest wheels once the EGG is moved into position to help keep it in place. NEVER attempt to move your EGG while in use or when the charcoal is hot! NEVER use the handle, mates, nest or hinge assembly as a personal support or grab-handle! ALWAYS PULL, DO NOT PUSH AN EGG WHEN ROLLING IT – AND NEVER ATTEMPT TO MOVE A HOT EGG. CAUTION, COALS ARE HOT WHEN IN USE AND MAY CAUSE INJURY IF EGG IS TIPPED OVER. The band hardware should be checked after assembly, and again as needed to maintain the dome-to-base alignment. Checking the tightness of these fittings after the first few uses is highly recommended, along with a rechecking at least once a year. Big Green Egg Natural Lump Charcoal lights easily when using our All Natural SpeediLight® Fire Starters, Electric Charcoal Starter or our new EGGniter for best results. NEVER use charcoal briquettes, lighter fluids or any flammable liquids in your EGG. This may void the Warranty, and will certainly make your food taste bad! DO NOT ATTEMPT TO COOK with the top vent cap removed. Your EGG will accelerate to very hot temperatures quickly and you cannot control temperature without the adjustable vent cap in place. NEVER leave an EGG unattended with the cap removed! IF YOU REMOVE THE SLIDING DOOR and safety screen completely, the correct reassembly order is the sliding screen first, with two tabs facing to your left; then the solid sliding door placed so it slides on top of the screen (not behind it) with the single tab located to your right. The only time the screen itself needs to be opened all the way to the right would be when EGG is cool, to remove ash. Keep screen in place, all the way to left, when EGG is in use. The position of the solid door, not the screen, controls airflow – and the patented screen provides a spark arrestor and safety feature. Always handle everything carefully as the metal tabs and metal screen may have sharp edges, and only remove or reassemble draft door when it is completely cool. Simply close both air vents and it will extinguish itself – close the top vent cap fully and slide lower draft door to tightly closed position. 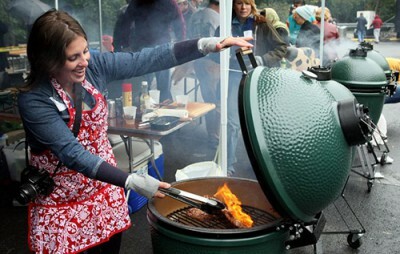 Use extreme caution when re-opening the dome unless the EGG is completely cool as the rush of air can re-ignite the charcoal. DO NOT USE A TABLE NEST TO SUPPORT AN EGG UNLESS THE EGG IS HOUSED WITHIN A TABLE OR AN ISLAND OR OTHER CUSTOM SURROUND! THE LOW-PROFILE TABLE NEST IS NOT DESIGNED OR INTENDED AS A FREE-STANDING SUPPORT for your EGG, and the EGG can tip over if not supported properly. Note that only the Mini and MiniMax have a low-profile Nest or Carrier designed to be used as a free-standing base. Although a concrete paver block (non-porous) or granite tile can be used to support the EGG when housed in a table or built-in, it is recommended that these be sufficiently thick for proper heat protection. For optimum heat protection, a Metal Table Nest placed over a granite tile may be used in combination – this is suggested if the EGG is placed over a wood surface such as a table shelf and is routinely used for long cooks or high temperature cooking. A granite tile is typically not very thick, and will not affect overall height significantly when used with a Metal Table Nest. IF THE EGG IS INSTALLED IN A TABLE OR ISLAND, IT IS IMPORTANT TO PERIODICALLY CHECK THE GAP AND AREA AROUND THE SIDES OF THE EGG to ensure that over time there is no deterioration of any surface adjacent to the EGG due to heat transfer. THERE MUST BE A SUFFICIENT AIR GAP AROUND THE SIDES OF AN EGG IF INSTALLED IN A TABLE OR BUILT IN! Check this area frequently for any signs of heat transfer. DO NOT open the dome fully and leave unattended if high winds are present. Wind gusts can spread hot charcoal or cinders, creating a fire hazard, and in extreme cases a gust of high wind may cause the dome to tip backward, possibly causing damage or injury. Always exercise care and caution in these conditions. DO NOT place an EGG inside any structure or storage area that may contain combustible materials if the coals are still hot – even if the EGG is not in use! The EGG must always be placed outdoors with adequate air circulation, and away from structures and NEVER inside an enclosed area such as a garage until it is completely cool. Note that depending on how much charcoal was burning within the EGG, it may retain heat for 24 hours, or longer if both vents have not been closed completely! CAUTION – smoldering charcoal will emit carbon monoxide which is extremely dangerous! Never place an EGG with hot or smoldering charcoal inside a structure where people or pets are present – even if the air flow controls are shut. Allow the EGG to cool completely before moving into indoor storage. BE AWARE THAT LOCAL ORDINANCES MAY SPECIFY A DISTANCE TO PLACE ANY OUTDOOR COOKER AWAY FROM A STRUCTURE, or may limit outdoor flame of any type during drought or fire hazard periods. DO NOT attempt to use an EGG inside a vehicle. If tailgating or picnicking, never attempt to use an EGG inside a vehicle or camper, and never store an EGG inside a vehicle unless it has completely cooled as smoldering coals will continue to emit carbon monoxide. ALTHOUGH MANY RESTAURANTS USE EGGS IN THE KITCHEN, INDOOR USE IS RECOMMENDED ONLY FOR APPROVED RESTAURANT OR COMMERCIAL APPLICATIONS, IN ACCORDANCE WITH APPLICABLE BUILDING CODES, VENTING AND FIRE SUPPRESSION REQUIREMENTS! A residential kitchen exhaust fan is not sufficient, and an EGG should never be used inside a residence or garage. Big Green Egg®, EGG®, EGGcessories®, The Ultimate Cooking Experience®, EGGheads®, MiniMax™, EGG Mates®, Nest® convEGGtor® and SpeediLight® are Trademarks or Registered Trademarks of the Big Green Egg Inc.